Bapu Cheppina Maata - A Play By Sarasa Navarasa is an event that took place on 31-Jan-2006 in Hyderabad. The local dailies have successfully proved that the youth of the nation is not very keen on its hold on history. So, as an addendum to that issue, it must be brought to the notice of the local dailies that the youth of the nation is not keen on their dailies as well. Whether or not the people know about national holidays or not, people must certainly know about the importance of communal harmony. That is exactly what the play by Sarasa Navarasa aims at bringing about. The play is called 'Bapuji Cheppina Maata'. It's a socio-fantasy satire about the way of life in the modern era - the way politicians can fuel communal disturbances, and how the common man is the obvious underbelly of the nation. The play starts off with Gandhiji speaking to two staunch followers of his. 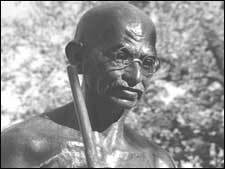 It looks at the vulnerability of those men in a cynical approach wherein they transform into blasting the statue of the Mahatma himself. Then comes to life that statue, and preaches about the shortcomings of the vision of men these days and how the struggle for independence was never a true success. The story is directed by Mr. E. Gopal Rao who has worked as a news-reader for AIR for over 30 years. He is also playing the role of Gandhi. Other actors are Vijaybhaskar (Addl. Comm. MCH) who has already won four Nandi awards for acting, H. K. Nageshwara Rao (who has acted in more than 1000 films in Tamil), K. K. Sharma (Retd. Registrar High Court), M. S. K. Prabhu, Bhilai Sharma, Laxminarayana, K. K. Basha. Sarasa Navarasa has been staging plays since 1978 and has produced 700 plays so far. It has also conducted 6 national drama festivals. For further details, please contact E Gopala Rao at 2780-8877. Be the first to comment on Bapu Cheppina Maata - A Play By Sarasa Navarasa! Just use the simple form below. fullhyd.com has 700,000+ monthly visits. Tell Hyderabad what you feel about Bapu Cheppina Maata - A Play By Sarasa Navarasa!